Pigs, Boars, Hogs, or whatever name you use to call these devils, you must include hardy, invasive, prolific and destructive. If this species is allowed to flourish on your property, your property will be destroyed! The longer you allow feral hogs to flourish on your property, the harder and more expensive their removal will become! Feral hogs will not stop tearing up your property until they have consumed everything worth eating and will make your life a living hell. Sport shooting works if you are only after a hog or two for a BBQ. 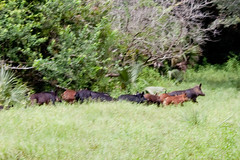 Hogs will head for cover at the sound of the first shot. Shooting from helicopters will kill a few more, but at what cost? Sure, it’s fun to fly around and shoot at Feral hogs with a high-powered rifle but are you really putting a dent in the population? Small cage traps will catch a few but you’d need a bunch of cages to really do any good. Feral Hog Removal, Feral Hog Trap, Feral Hog Traps, Feral Hog Trapper, Feral Hog Exterminator in Shreveport LA, Bossier City LA, Barksdale Air Force Base LA, BAFB, Haughton LA, Keithville LA, Greenwood LA, Stonewall LA, Elm Grove LA, Blanchard LA, Doyline LA, Frierson LA.